“No one can stand as I can”, says Alma (Vicky Krieps), her face illuminated by the embers of a fireplace as she addresses an unseen audience. She speaks of “the most demanding man”: one Reynolds Woodcock (Daniel Day-Lewis). A fashion designer, we first see the man during his rigid grooming ritual. Every action, from applying shaving cream, to trimming his nostril hairs, to putting on his socks, emphasizes Woodcock’s purposeful determination. Each movement is a precise consideration, where acting in haste suggests something perverse - a disruption of order and the creative process. That’s why he needs his sister Cyril (Lesley Manville). She’s his keeper, his old “so-and-so” that manages the house of Woodcock. She’s attentive to the needs of the house, first seen opening and closing doors, functioning as the tangible, logical garrison of a house cursed by ephemeral spirits. Confessing to Cyril that he’s plagued by dreams of his departed mother, Reynolds takes to the countryside. At a seaside restaurant he encounters Alma. She’s clumsy, tripping upon herself as she collects dishes from an adjacent table. Here, Anderson notably fixes his camera on a close-up of Reynolds; the sun illuminates the screen, overwhelming the actor’s presence. The close-up is longer than you’d expect and in essence speaks to numerous concerns that arise within the film’s text: the “most demanding man” is forced to wait, left hungry, and may need to concede that he indeed needs to begin slowing down. Anderson touches upon this notion of acting strong. Given that this is a film set in the fashion world, you’ll overhear characters suggest how Woodcock’s garments inspire confidence. They feel as if they are complete, as if they achieve some sort of ideal shape in the eyes of their observers. But it’s intriguing to see when this prophecy goes unfulfilled. When the proprietor of Woodcock Manor, Barbara Rose (Harriet Sansom Harris) is being fitted for a dress, she’s fussy and unaccommodating. She’s a lummox and ends up drunk and passed out in one of his dresses, much to the chagrin of its maker and Alma. It’s Alma who persuades Reynolds to do something about it, as the two charge to strip Barbara of the dress themselves. What the sequence conveys, as Alma and Reynolds passionately embrace immediately after this act of ransacking Barbara, is that such material objects rarely inspire true courage. 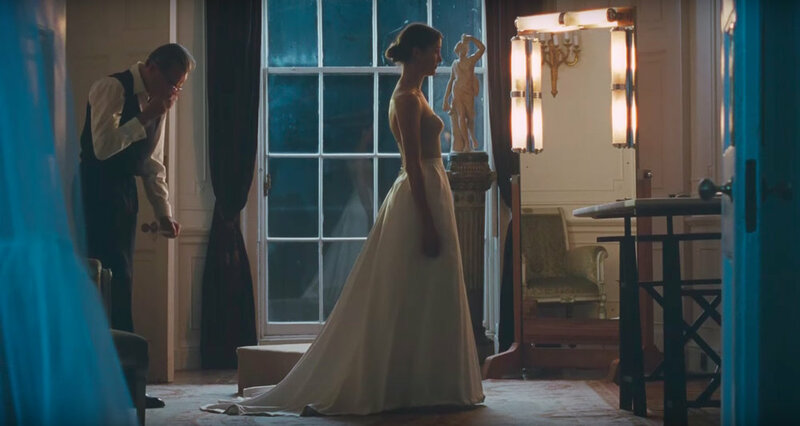 Courage, of the Phantom Thread variety, is less a matter of tangible objects and action than something ephemeral. The veneers of confidence – articles of clothing or our boorish gloating – buckle under the weight of a weak constitution. It’s realizing our smallness and weaknesses, along with the need to depend on one another that cuts past these ornate exteriors and goes straight to the bone. No one stands like Alma can, as she weathers the storms of Reynolds and Cyril’s sour hearts and breaks a curse that has afflicted the house of Woodcock. The suggestion being that a house that doesn’t change is a dead house. The end of Phantom Thread is one of rather peculiar joy – one where slowing down begets relief and inspires hope.